A radio interview of bigfoot author and expert Thom Powell was conducted by radio host Bill Lee back in 2012. It happened so long ago it is all but forgotten. It recently surfaced on Shawn's BigfootEvidence blog and is republished here. The interview occurred just after the release of Thom Powell's second book, Shady Neighbors: a fictional story (novel) about a slightly clueless science teacher who has a family of sasquatches that are hanging around his rural homestead for some unknown reason. As the story unfolds, the reason for the sasquatch presence becomes more evident to everyone except the clueless science teacher, who is always the last to catch on. It might be obvious to the readers who know the background on the author that the story contains many autobiographical elements pertaining to Thom Powell's life. The book is therefore a bit of a humorous send-up of Thom himself. Of the three books published by Thom Powell, Shady Neighbors, continues to be a favorite. This interview was conducted shortly after the release of Shady Neighbors. 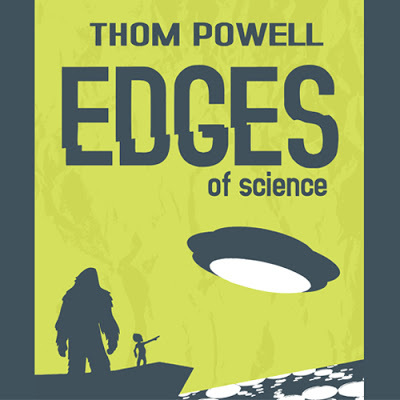 If you listen, you will also notice that the ideas kicking around in Thom's head at the time will eventually materialize into his third book, an anthology of scientific and paranormal topics entitled Edges of Science. Click here to hear the interview. Hope you enjoy listening to the interview. To purchase a copy of Shady Nieghbors you can go to Amazon or click on the sidebar to the right of this blog post. I read "Shady Neighbors" a few months ago; It's a pretty good book. Shady Neighbors, as you know, was a scripted play in my life years before it was in print! A synchronicity as you called it!